Theodor Dingermann, born 1948, studied pharmacy in Erlangen ­and received his doctor title in 1980 to become Dr. rer. nat. In 1990 he was offered the C4 professorship at the Institute for Pharmaceutical Biology, University of Frankfurt. 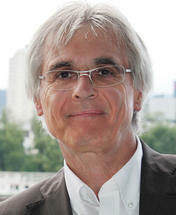 From 2000 to 2004 he was President of the German Pharmaceutical Society. Further, from 1998 to 2000 he was Vice-president of the Goethe University, Frankfurt/Main. Dingermann is involved in many committees. Among other things, he is a member of the Scientific Advisory Committee of the Perso­nalized Medicine Foundation, Speaker of the Scientific Advisory Committee of the Federal Chamber of Pharmacists and Biotechnology Representative for the state of Hessen. He is chief editor of the scientific journal “DIE PHARMAZIE” (“The Pharmacy”), editor of the magazine “PHARMAZIE IN UNSERER ZEIT” (“Pharmacy in our Time” and member of the Editorial Board of the PHARMAZEUTISCHEN ZEITUNG (PZ) (“Pharmaceutical Journal”). In 2007 he received the 1822 University Award for excellent teaching (awarded: € 15,000), in 2009 was elected for „Professor of the Year“ in the category Natural Sciences and Medicine, and received in 2010 the Carl-Mannich-Medal of the German Pharmaceutical Society. Why biosimilars and not biogenerics?